But the numbers don’t lie. According to research performed by CareCloud, almost 80% of patients use web search to help them make medical appointments — and optometrical services are no different. Simply having a website is a good start, but it isn’t enough. To maximize your performance in today’s crowded market, you need a digital footprint that stands out from the crowd. The best optometry websites use proven design strategies and well-written content to boost their SEO power and make their business relatable to clients. A great website needs to have aesthetic appeal and intuitive functionality, of course — but the less-visible details also matter, like load speed and responsiveness. So what does that look like, exactly? Glad you asked! Here are some optometrists and optemelogical firms who’ve done the job right. This Santa Fe-based practice brought their A game when it came to designing their website. Accent Vision Specialist’s visitors are instantly greeted with a bright and beautiful header image, which scrolls to reveal some of the firm’s specializations, including contact lens fitting, dry eye treatments, and even permanent makeup. Along with its easy-to-understand user interface and pleasant color scheme (did you notice how much of the accent text matches the turquoise in their logo? ), Accent Vision knocks it out of the park with its sheer amount of content, all of which is well-written and legitimately helpful to potential clients. Well-written content is one of the biggest factors affecting SEO these days… which is probably why these guys turn up first in line if you google “optometrist” while you’re in Santa Fe! Accent Vision have separated out their optical, medical, and diagnostic services, and each section then links out to even more specific pages. They’ve also got a nice “meet our doctors” page, with substantial biographical content about both physicians — a move that puts patients at ease and humanizes the practice. While this website has a lot going for it, we do see just a couple of instances where there’s room for improvement. For example, in the copy under the abbreviated “meet the doctor” section on the main page, there are a few broken characters — and the animations that swoop the photos and features onto the screen are a little bit clunky on mobile. 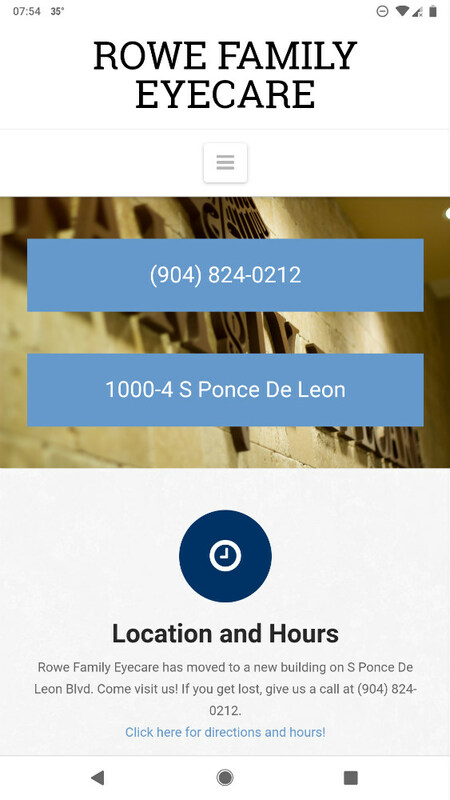 A small practice out of Saint Augustine, Florida, Rowe Family Eyecare’s website is simple and intuitive, bringing patients the information they need without any salesy distractions. Their homepage offers quick access to essentials like the firm’s location, phone number, and new patient forms, and also features a TED talk about vision as an embedded YouTube video. For one thing, the site is crazy-navigable: no matter where you go, the toolbar dominates the screen and makes it easy to find what you want. And just like Accent Vision Specialists, the staff took the time to flesh out a nice meet-and-greet page, which provides clarity and comfort for both existing and new patients. Unlike many other modern websites, Rowe Family Eyecare dispensed with the flashy animations… and that can actually be a good thing for load times and site responsiveness. When we pulled up the website on our smartphones, we found a pared-down version of their content that emphasized the most important information: phone number, location, and hours. While having new patient forms available for download is good, having a system that would allow clients to submit them online would be even better. And while we love the idea of a map widget, the Google Maps display they’re using on both the location and homepage is a little bit glitchy. Alaska may be the last frontier of America, but their eye doctors are totally 21st century — at least, Lodestar Family Eye Care is. With a website that’s built for ease of use and a paperwork-free experience, this practice understand what today’s patients are looking for. What’s more, the firm’s marketing and branding is just plain excellent. 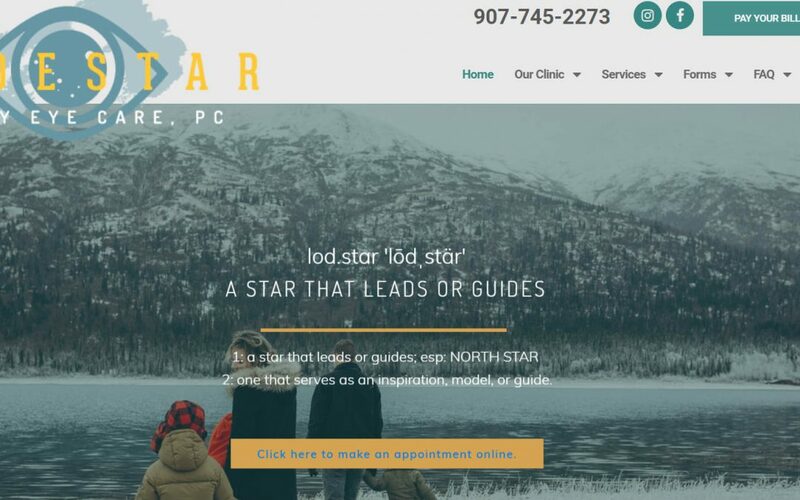 We didn’t know what a lodestar was before we discovered their practice, but the banner image with the definition made everything click instantly — and made us want to hire these guys as our doctors even though we’re far away from Alaska! Although the site is responsive on mobile devices, their logo is a little off-center on our Android smartphone. And the banner images, while beautiful, are sometimes a bit grainy — which isn’t exactly befitting for a vision-focused business. At 2020 Designs, we’re focused on helping you create a website that will boost your business and help facilitate the easy patient experience you already work hard to create. We offer a variety of web design packages at easy, one-time-fee prices, and can also offer ongoing site management for an affordable monthly payment.